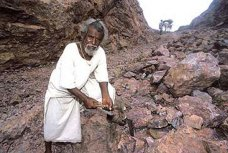 Dashrath Manjhi carves a through a mountain with his bare hands. What can you accomplish is your desire is strong enough? You can carve a road through a mountain using a hammer, a chisel and nails. You could! Dasrath Manjhi‘s desire spawned from the fact that his wife was injured and needed immediate medical treatment because the nearest town was 70 km away from their village in Bihar, India. His wife died. That was back in 1967. Manjhi was taken aback at his loss. This incident motivated him to carve a path through a rocky hillside, all by himself, in order to make it easier for his fellow villagers to access schools, hospital, markets and neighboring villagers. He worked at it for 22 years. People thought he was crazy. Selflessness? Sure. Absolutely, but he also lived with a deep desire and love. He did not want anyone else to suffer the same fate as his wife. Because of him, the distance has been reduced from 55-km trip to the hospital to 15 km only. They keyword is desire. You can do anything if you desire. What can we desire today that does not come from pain and hurt? What can we desire that creates peace between our fellow man? What can we do right now? We know that we have the ability? What can you accomplish? What do you desire?